Glistening waters fringe the harbour in Victoria, the captial city of British Columbia. During the summer months the waterfront is bustling with tourists enjoying the atmosphere and balmy weather, while buskers work to entertain. 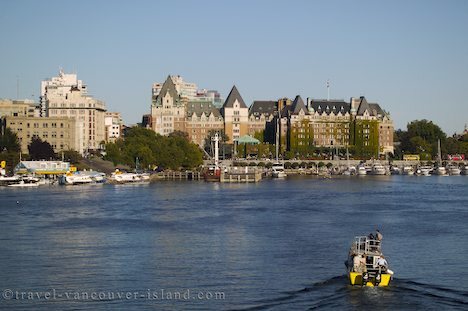 Among the main attractions of the waterfront area is the historic Empress Hotel which overlooks the harbour. Visitors can enjoy their famous devonshire tea which is served every afternoon. Meanwhile the large variety of boutiques in downtown Victoria cater to a number of retail needs. Harbour / Waterfront in downtown Victoria, Vancouver Island, British Columbia, Canada. Picture of the harbour in downtown Victoria on Southern Vancouver Island, British Columbia, Canada.